A couple months ago, we received a call from Micah Morgovsky, CZT. She is an active Certified Zentangle Teacher and Cantor at Temple Sinai in Stamford, Connecticut (USA). Micah asked if Maria and I would consider tangling during their upcoming Rosh Hashanah service. She would project our tangling on a giant screen so the mesmerizing pen strokes would not only help focus attention during the service but would result in beautiful artwork to memorialize the occasion. During the following weeks, the three of us discussed details and sorted out logistics. The day before Rosh Hashanah, we arrived at Temple Sinai to set up our document camera and test everything. This beautiful, bright and open space had seating for about 750. Above the worship area, were two giant screens . . . each ten by fourteen feet. The left screen would show the Rabbi, Jay TelRav, Cantor Morgovsky and other participants throughout the service. The right screen would focus on the tiles as we tangled. During the service, Maria and I tangled six triangular tiles symbolic of the six days of creation. Each tile measured about 4.75" (12 cm) on a side. We paced ourselves so that we began each tile at a certain moment in the service. We traded back and forth as we tangled each tile. We decided to use mooka as a connecting theme, but in true Zentangle fashion, we did not plan the specifics of any tile until seconds before we began tangling that tile. It begins as a blank page. The universe begins unshaped, open to endless possibilities. The creation of Torah begins, parchment untouched, open to endless possibilities. We, too, enter this day with the promise of new beginning, open to endless possibilities. Rosh Hashanah, the beginning of a new year. Today is the day God created the world. And today is the day we partner with God in creating ourselves anew. Above me, you may have noticed a large blank screen. This screen, like the parchment of a new Torah scroll, will mirror our own spirit of renewal. For today is a day, today is the day, of creation. If you and I have had the opportunity to chat these last few years, you’ve probably heard me speak about Zentangle. Zentangle is a meditative art form which employs simple repetitive patterns to calm and focus the mind and, in turn, create unique and intricate artwork. We are so blessed and honored to have the founders and creators of Zentangle - Rick Roberts and Maria Thomas - with us here today. Over the course of our worship this morning, Rick and Maria will be tangling, creating Zentangle art, on six triangular paper tiles - one for each day of creation - and you’ll be able to watch their breathtaking artwork unfold on the screen over our heads. 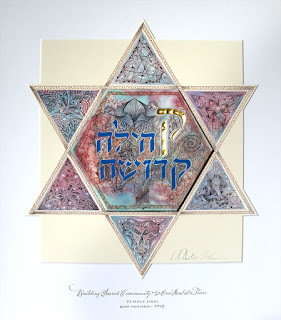 When finished, the triangles will form the points of a magen david - a Jewish Star, the center of which is made from vellum, animal skin, much like the Torah itself, and has been tangled on and inscribed with gold-leaf and Hebrew calligraphy with the words K’hilah K’dosha - sacred community. The completed work is Rick and Maria’s gift to Temple Sinai and we plan to display it prominently within this sacred space. To that end, we are confident that Temple Sinai, this K’hillah Kedoshah, is comprised of open-minded and creative souls who do not shy away from new experiences. So today, watch, listen, sing and pray, as we join God in bringing into this world something that has never been before. It begins as a blank page. We begin as a blank page, and together we will create something new. Please join me, as our work begins, with the blessing over Torah on page 112, a blessing of gratitude, for the gift of learning, and for the opportunity to engage our hearts and minds in the sacred work of renewal and creation. After Micah completed her introduction, we began to tangle and continued throughout the service. As the service was ending, I placed the six triangle tiles in their spaces on a mat that Maria had cut and tangled and put that into a frame so everyone could enjoy the result. The center hexagon was created ahead of time on vellum (calf-skin) like a traditional Torah. Maria began the center hexagon by applying a background of multicolored gouache. The she lettered the Hebrew and gilded the large initial letter. The words translate to "Sacred Community." (Hebrew reads from right to left.) We both took turns tangling the background using Sakura® Micron 05 and 01 pens. Maria used the same multicolored gouache on the triangles which were made from 100% cotton Rives® BFK print making paper. The immediate enthusiastic feedback validated the value of Micah's idea. People kept saying how the gentle cadence of our tangling helped them stay focused throughout the three and a half hour service. The finished piece measured 22 x 26 inches (56 x 66 cm). As beautiful as each individual tile was, no one expected how exquisite the completed piece would be. This use of the Zentangle Method as an integral component to support focus and attention during a ceremony or event and create a piece of art that anchors and memorializes the event opens up an exciting new area of exploration for the Zentangle community. This was the first time Maria or I had attended Rosh Hashanah or had even been in a temple. The service was moving and powerful. We were honored to be part of it. We will always remember the warm welcome and new friends that we made. We are grateful to Micah, Rabbi Jay TelRav, and the community at Temple Sinai for this opportunity. How have you incorporated Zentangle art in an event or ceremony? Do you have ideas about how you might do that? We (and everyone) would love to learn from your experience and thoughts. We will randomly choose someone who posts to send a thank you for contributing to this important topic. Lady Dragoness, you were randomly selected from our previous blog. Please email your mailing address to julie (at) zentangle (dot) com. What a beautiful way to share Zentangle and learn something new about yourselves and others! I love the finished artwork, it is exquisite and so meaningful to you, Maria and Rick as well as the community at Temple Sinai, well done everyone for collaborating and to Micah for coming up with the brilliant plan. I have shared Zentangle in so many ways in my community and those surrounding me, by talking about it at local schools during Alberta Culture Days here in Morinville as well as teaching children how to tangle as well, teaching the Rotary Club of Morinville Zentangle before they started their day at 7:15 a.m. The Rotary Club of Morinville thought I was going to talk about Zentangle and I said, no you are going to do Zentangle while I tell you about it, they were thrilled and asked me to come back to teach them again, they enjoyed it so much. Giving back in the community through the art of Zentangle is something I am passionate about and keep doing. Other times I have taught people tangles at Winter Wonderland in Bon Accord, a neighbouring community at their winter festival. I have been involved in Alberta Culture Days though events and art in my town for many years and I firmly believe that we can all make a difference in how we live our life with art included, in this case Zentangle! I loved the very inspiring story, it is wonderful to see Zentangle growing still after all these years! WOW! What an amazing idea for the Zentangle concept of art and meditation...Such a beautiful result from you both and a great contribution to the community! So beautiful how the art of Zentangle reaches a meaningful core wherever it lands. Wow! This is incredibly moving. So glad you could share Zentangle during this high holy day service. Wonder full! Thanks for sharing this beautiful experience! I saw a the photo on Instagram, and couldn't wait to read the blog post. Both are beautiful. The closest (so far), I have come to using the Zentangle Method for an event was our local "Arts Alive in the Park". I wanted to demonstrate with participation of the fair goers, the Zentangle Method to gain interest in the art form. I had a piece of flip chart paper, and markers for folks to use. One of the most memorable moments, was a young man of 20-24 years of age, came and spent about half an hour or so. He drew a couple of tangle patterns with me, and then he went his own way with it. With his contribution and others, I had a collaborative piece. I didn't get pictures, and one of my helpers to take down my booth, threw it in the trash. :( Being able to share the beauty of this art form with many people over the weekend, was an uplifting and joyful time for me. That is the most beautiful imagery and approach to Rosh Hashanah I have ever heard -- wish that I had been there to experience it! The finished piece is amazing -- any chance of making prints of it? The beauty of God's Creation reflected in Zentangle art. Each time we pick up a blank tile, we have a new beginning, steeped in meditation and mindfulness. Magnificent art! That was awesome. Zentangle has really helped me, I found it at a time when I needed something to calm my anxiety. I have showed this to friends, and family, and I can are the difference it has made in their life also. Thanks from all of us. I just copied and sent your blog post to our Rabbi/Cantor. I can just imagine the beauty and peacefulness of the service. I thank you for sharing Zentangle with the Temple Sinai community. Last October my son-in-law, who is deaf, asked me to tangle a Ketubah (Jewish Marriage Certificate) my daughter and his tenth anniversary. They had a Jewish ceremony to renew their vows. I can't figure out how to add a picture to this post. I was so honored to do this. Thank you for the Zentangle Method and sharing it with all of us. If only we could heal this world one stroke at a time. Each day is a blank canvas with the opportunity to create a beautiful new page in the mosaic of our lives. It's so easy to forget that. Thanks for reminding me to treat each day as if creating a new piece of art. Thank you so much for sharing this experience and for making this beautiful piece for this Temple in Stamford! As one of few remaining practicing Jews in the Netherlands and as a CZT this post make me so happy! The Rosh Hashana service is special to me, also because my husband blows shofar! Had you herted that sound before? The message to see each day as a blank canvas is owerful. I need to be reminded of it often and my Zentangle practice does just that! As far as other ceremonial projects are concerned: I made an invitation for my son's Bar Mitzvah. I drew a sailboat, since it sails towards a future and sailing is my sons passion. I filled the sails with my sons favorite tangles: nzeppel, rain and aura knot. that was a beautiful experience. And a nice card as well! Tangling the Hebrew Alphabet would be wonderful and tangling a personal set of affirmation cards would als be cool. Just thank you for being open and generous Rick and Maria. Happy the shul experience was meaningful to you! A wonderful post ! I haven't incorporated Zentangle art in an event or ceremony yet but this post has inspired me to look for opportunities to do so. This was a brilliant idea, wonderfully executed. The result is a truly magnificent work of art with the added bonus of having come together as a community to share in its creation. I am deeply touched by the thinking that went into this celebratory creation event. Thank you all for this deeply inspiring celebration of the Divine as expressed in our human creativity. I have always believed that the Creator dwells inside of each and every one of us. When we give ourselves the freedom to create, we are in union with the Divine. This is beautiful! I am teaching a Zentangle Basics and a Zendala class at my church this weekend, and I will share this idea there. We do a lot of interfaith services here, so I may see if we can incorporate Zentangle in such a service. I think it is a beautiful sharing of community, art and spirituality. Thanks so much for sharing! Yes, The Zentangle Method and many of its tangles fit beautifully with Scripture. My congregation has had two CZTs in their midst. I practice it routinely as part of my Bible journaling habit and have kept notes in a notebook I call "Tangling as a Worship Art" notebook that I may (or may not) publish someday. My church has incorporated Zentangle and ZIA's into retreat activities and devotional materials. My pastor once distributed blank tiles at the beginning of the message and invited all to color or tangle while he spoke. The mosaic at the end of the service was inspiring and awesome. What an extraordinarily beautiful coming-together of two rich and deep traditions. A gift to you and a gift from you to the Temple. So moving and inspirational. Thank you for writing this. Your post and the resulting piece took my breath away. The symbolism of a blank slate then filled with complex tangles is a beautiful expression of the service. The ending piece is stunning. Many of the responding CZTs have come up with some inspiring venues for sharing the Zentangle method. To date I have worked on my own pieces on my comfy sofa except when in church. When the pastor rises to speak I find a workable spot on the church bulletin and tangle while he preaches. My tangles are placed on white space or directly over the print. Many times I incorporate a word or phrase from the bulletin and tangle around it. I see now that I need to take it to the congregation in some way. Thank you for the inspiration. Thank you for sharing your story. It's wonderful to read about combining Zentangle with prayer. I myself haven't done anything like this, yet. But I do feel a connection with my latest project: I tangled on a coffin. While tangling the future use, the ceremony that it will be involved in, was constant on my mind. How cool is this! I'm so glad you did it, Rick and Maria, and so glad to know about it. Worship among Quakers has much in common with the zentangle method - contemplative silence, centered and grounded, no prior programming or planning, letting spirit move where it will. I often use tangling in my personal devotions. I'd love to do Quaker worship-sharing with people who knew even a little about tangling - a circle of people sharing silence together, each reflecting on a common theme and each speaking when moved about that theme - but I'd include speaking and adding a tangle to a common tile (maybe an opus tile). That way the group would end the worship-sharing with a profound worship experience, many insights into the theme, and a beautiful collaborative work of art to express the awe. It could be done in a secular setting as well, of course. Incredible! What a wonderful event! I am going to have to put my thinking cap on and think of a way to honor what you have done. This is unbelievable! What an amazing way to share Zentangle while inspiring others to focus on this beautiful renewal of faith. I am a convert from Judaism to Christianity. I really appreciate the traditions of the Jewish faith and have been to many ceremonies and services. In the past 5 years, I have been very active in my church. I am known as the Zentangle lady because I am tangling during Sunday school and Bible study and whenever I have a free moment. I sing in the choir so I can't tangle during the service. Last year, my women's group had an auction called "Missions Possible". I donated a ZIA and also a private class. Both of them were purchased and both recipients were very pleased with their "prize". I have been asked by our local library, to do a program this month. I would love to do some tangling to music as they are both my passion! Thank you for sharing this amazing day with us. What an amazing and lovely way to share in the tradition of Rosh Hoshanah. I will have to talk with my pastor, who is a tangler, too, about incorporating Zentangle into one of our services. Thanks for sharing this experience! It's really amazing idea!